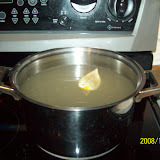 Boil all the syrup ingredients in a pot for 15 minutes. Let it cool down. Heat the vegetable oil, water, vinegar and salt in a pot. When it starts boiling add the flour in. Stir it well until the mixture becomes doughy. Remove from the heat put aside for a few minute. When it becomes cold enough to touch it, add the eggs one at a time. Each egg should be well blended before adding the next. Heat the frying oil in a large cooking pot on low heat. Fill in your syringe with the dough (you can use a pastry bag, too). Squeeze out pieces. Break them off with your finger or a spoon. Fry them until golden brown(see the pictures below). Put all the fried tulumba into the cold syrup. Leave them in for about 5 minutes and stir occasionally. Make sure they all soak in the syrup. Place them in a serving plate. Enjoy!